If you’re a regular follower of my blog you’ll have heard me mention my friend Frin who, amongst other things, runs the Boot Camp I struggle to get through twice a week. But there will be no more Boot Camp for a whole year as she and her family (including the dog!) have decided to spend the year sailing round the Mediterranean. They are actually doing what most people only dream about, which is amazing. Although I will miss Frin loads (and so will my fitness levels) I’m really looking forward to meeting them somewhere during their travels. And until we meet up I will be following their journey via her blog, Windfall Adventures. And if you are the tiniest bit interested in what it’s like to take a year out with your family and spend it sailing around the Mediterranean, I recommend you follow it too! Just before they left, Frin’s daughter Olivia had her 10th birthday and Frin – who by that stage had packed up pretty much her whole house and put it in storage – asked me to make Olivia a birthday cake. 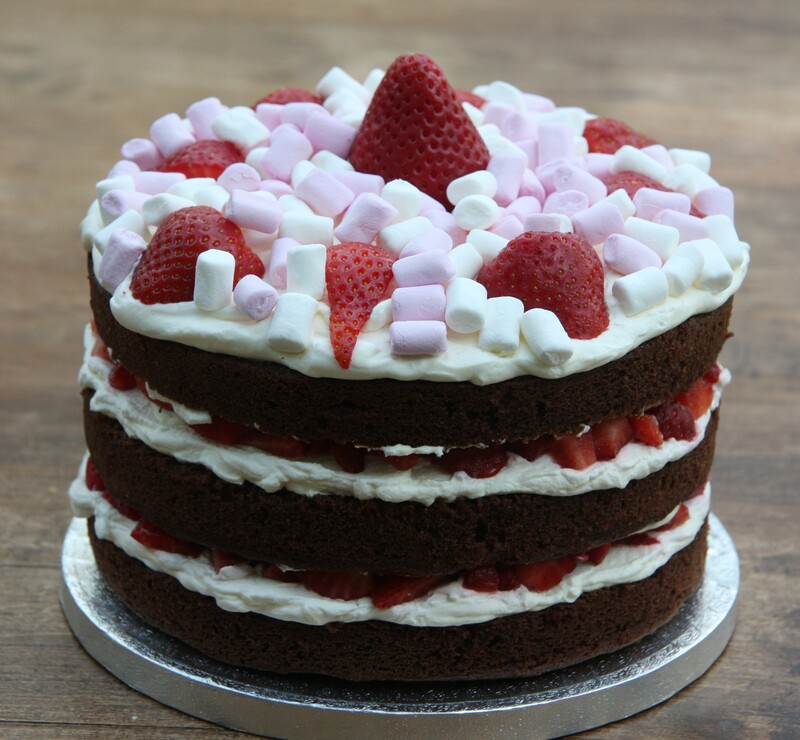 By a process of sneaky questions, she established that Olivia’s ideal cake would be a chocolate cake with strawberries, cream and marshmallows. So that is what she got. Blogging has been very low on my list of priorities over the last few weeks and I have missed it; I haven’t even managed to keep up with reading my favourite bloggers’ posts. A couple of weeks ago I moved out of the house I have been renting for the last three years but don’t move into the house I am buying until next week. In the meantime the kids and I have taken advantage of the amazing generosity of another friend, Vana, and spent ten days in Greece. So I have been a bit preoccupied with moving, work and the end of the school term and have lacked the time and energy (not to mention the kitchen!) to do any baking. Our holiday in Greece came just at the right time and it was wonderful. We were in mainland Greece, on the Halkidiki peninsula, and went to the pool and the beach and on a couple of boat trips. We got to experience the area we were staying in from the land and the sea. We tried pretending that diving off a boat into beautifully clear waters was our way of life for the next year (although I’m sure there is a bit more to it than that!). 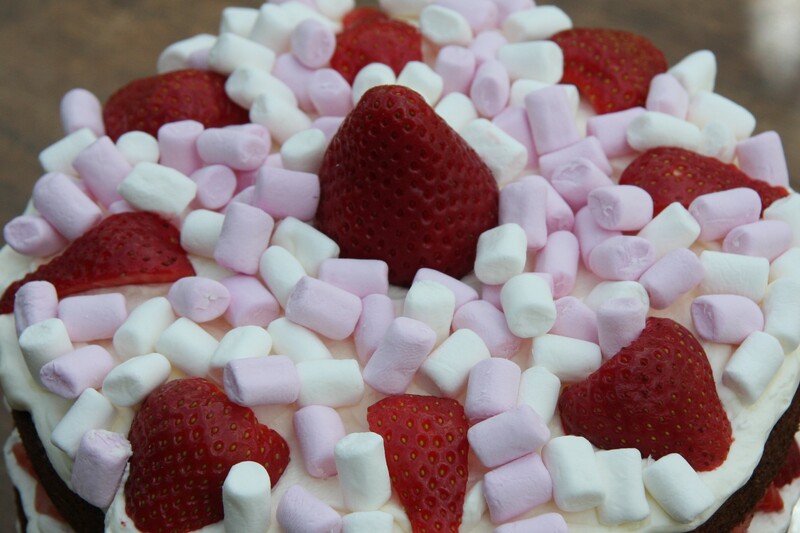 Olivia’s cake was a three layer chocolate Victoria sponge, filled with cream and strawberries and topped with cream, strawberries and mini marshmallows. Set the oven to 175°C and grease and line the base of three 8″ sandwich tins. Sieve in the flour and cocoa powder and fold in carefully. Divide the mixture equally between the three tins and level very gently. Bake for around 20-25 minutes, or until the cakes are all well risen and firm to the touch. Leave to cool in the tins for a few minutes before turning out onto a wire rack and allowing to cool completely. When the cakes are completely cold level the tops of two layers. The top layer doesn’t need to be levelled unless it is uneven. 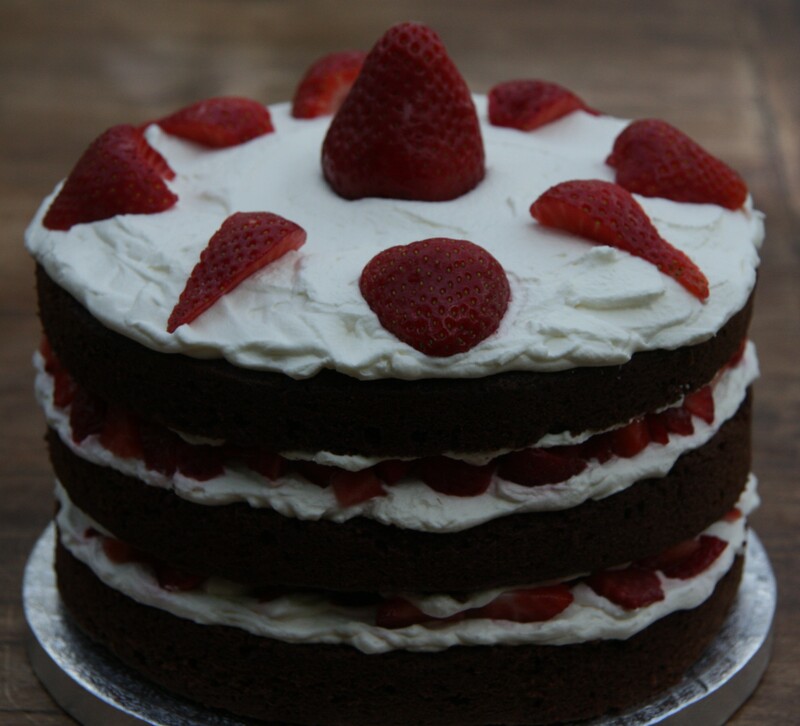 Whip the cream until it is firm and chop the strawberries, keeping some whole to decorate the top of the cake. 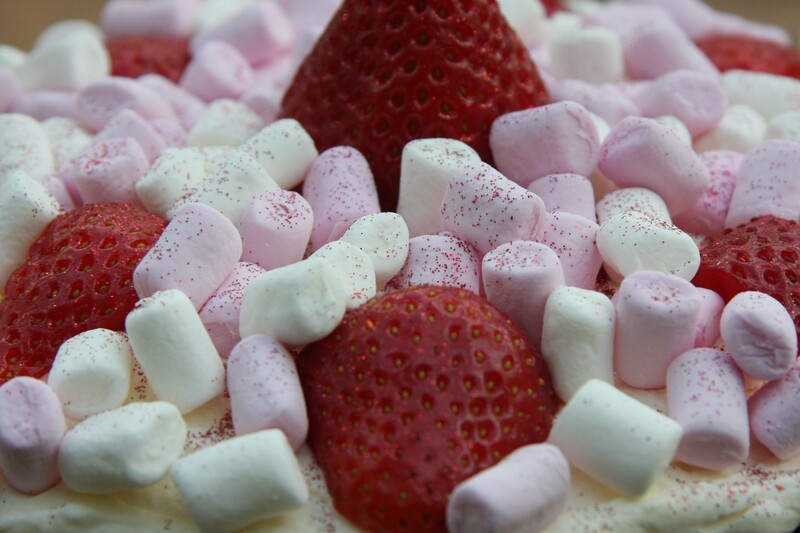 Put a generous layer of cream on the first sponge and top with a generous layer of chopped strawberries. 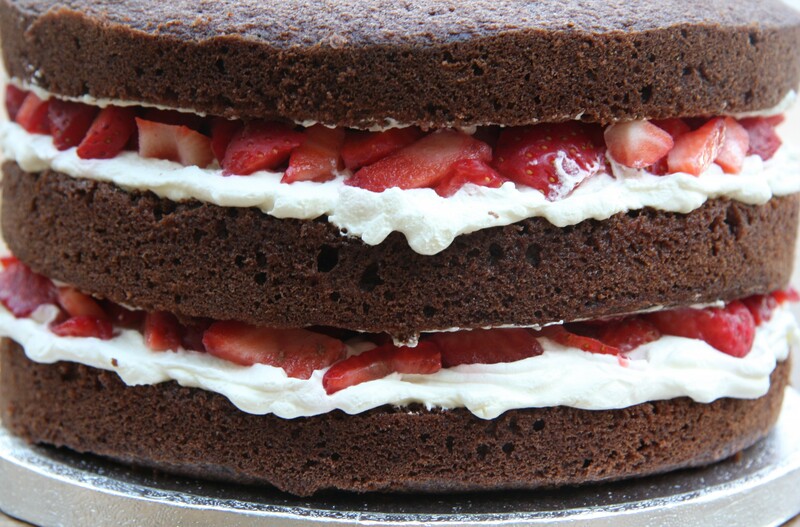 Spread a very thin layer of cream onto the bottom of the second sponge layer. Add the second sponge layer and repeat. And some glitter too, if you have it! Happy birthday to Olivia, good luck to Frin, Jon, James and Olivia (and Dora the dog) for their year away and thank you very much again to Vana for her amazing hospitality. I consider myself very lucky to have such wonderful friends. Lovely, as ever. Best of luck for the next few weeks. Olivia has been very lucky to have a birthday cake like this one! Looks absolutely scrumptuous! So does the photo of Greece. I will be following your friend’s blog for sure, thanks for the tip. And good luck with your move! A beautiful cake, and a beautiful post about life, friendship, and all sorts of sweetness!